A few days ago I wrote about the aggressive business class fares from London to Seoul offered by Air France and KLM. You can get as low as £1329 return for much of the year. These are the lowest fares for 2019 found when searching on klm.com and using the default departure period of ‘Between now and January 2020’. It is worth noting that these fares are widely available throughout 2019. These flights need to be credited to a SkyTeam frequent flyer programme such as Flying Blue or Delta SkyMiles. However, if you are travelling from April onwards it is possible that you will also be able to credit them to Virgin Flying Club – it depends on the official start date for the new Virgin / Air France KLM joint venture. Look at reviews of the plane you will be using before booking, as Air France still has some with sloping beds in Business Class. 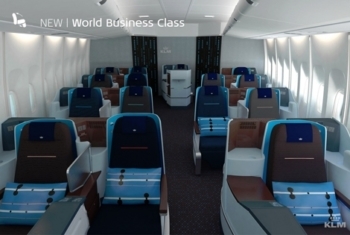 I believe that KLM is now fully flat on all aircraft – see an example seat below. Have a play around at klm.com and see what you can find. Radisson Rewards – the loyalty scheme for Radisson Blu, Radisson RED, Radisson Collection, Park Inn and Park Plaza hotels – has launched its new Spring promotion. If you can push a lot of business their way over the next 10 weeks it could work out very nicely indeed. The bonus posts cumulatively. You receive 1,000 points after your first night, an additional 2,000 (total 3,000) after your 2nd night, an additional 7,000 (total 10,000) after your fifth night etc. I value a Radisson Rewards point at around 0.33p. This means that you are getting a very modest £3.33 return if you do just one night. If you do exactly 20 nights, however, you will have received a bonus of 120,000 points which is worth around £400 – that is a VERY attractive £20 per night! Existing bookings WILL count. Interestingly, points and ‘points and cash’ stays will count too. This means that if you can find a very cheap 9,000 point hotel (there are none left in the UK but they still exist in other countries) and stayed there for 20 nights, you would get 2/3rd of your points back! You MUST register in order to take part, which can be done at this page of the Radisson Rewards website. Marriott Bonvoy officially launches on 13th February! OT but think the new white colour scheme gives a retro feel to the rebranding. Totally O/T just looking for some advice really. Thinking about my summer 2020 holiday (i know its ages away lol). I have a BA 241 and enough avios for most places. I also have about 150k virgin miles between me & OH. We usually head to the US but are considering Asia this time. I would like to do Beijing and Xi’an, first timers to China so just the usual tourist stuff. We are hoping 14-16 days in total but would like to start or preferably end the trip with a relaxing beach holiday too. Any flight itinerary suggestions? Beijing and Shanghai are very good for availability in F for two (and more) seats on BA to use the 2-4-1. Hong Kong isn’t terrible but is less open. Thanks Richard, any ideas about the beach part? Take a flight to Malaysia and either go to Penang or Kota Kinabalu (Rasa Ria or Tangung Aru). Have stayed at all 3 Shangri La hotels. Penang is my personal preference as food is best but if heading to th east coast I prefer Rasa Ria resort. Thanks Tilly, already been to Penang many moons ago as a side trip from Kuala Lumpur. Dis enjoy it but want to try somewhere else…..
Time as usual will be the problem but if it allows consider Guilin area, or perhaps Shaolin by train from Xian. We went to China for 3 weeks in 2016. Highlights included Hua Shan (near Xi’an), the Great Wall at sunset at Jinshaling, walking around the Ping’an rice terraces (north of Guilin) and seeing a viewpoint at Xianggong (Yangshuo) at sunrise. The country in places is beautiful. We didn’t like the people much – many were actively racist, but prob OK if all in party are white. We wouldn’t return for this reason alone. And food was a disappointment on the whole. Thanks Genghis, very honest opinion. Will bear it in mind. For me it’s more the ticking off the bucket list of the Great Wall of China. As we will be taking two teenagers it will have to be a mix of culture and relaxation, hence the push for a few days at the beach too. We did exactly this last summer. Into Shanghai on virgin miles (good availability in upper), bullet train to Beijing (wall, tiananmen sq etc), fly to zhangjiajie on air China (amazing cloud forest), overnight train to Guilin (go to the countryside in yangusho- best part of the trip). There is a lovely hotel called Aliya in yangusho. Would highly recommend. Then fly to Hong Kong (can use Avios to book expensive internal flight. We saved about ~£700 for 5 people)! If you want beach you could go to Sanya. Didn’t go myself but called “Chinese Hawaii” so could be fun! Some good ideas, thank you. Did look at Sanya, seems like it would be nice….. Both Beijin and xian are great places to visit with lots to see and do. Flights to Shanghai with Virgin – than you can take the 2hr express train to Beijing. I’ve been Beijing in several occasion and had the pleasure of spending 4 days in Xian. I personally found Chinese very friendly and nice people. Have been there many times and have a number of native Chinese fiends from my time at University in the UK. The culture is very different however that is part of the beauty of going to a different country. Highlights in Xian include the TErracota Warrior, cycling around the old city wall, drum and bell tiers and one of my favourite the Muslim street full of amazing restaurants serving lamb dishes and street food stalls. There is also a beautiful historic mosque built in Chinese style architecture – one of the highlights of my trip to Xian. In Beijing I recommend the Forbidden City, Summer Palace along with the Great Wall. Watch out for the tours that take you for a pit stop to “silk museums” where the tour guides make a cut in any purchases. Whenever visit China you better to avoid their public/national holiday, otherwise you will end up in queuing an hours wherever you are going to visit! Amex Gold gives double points on overseas travel. Not sure about the others sorry. Depends if it is a Marriott / SPG hotel or not, SPG would be double if so. A 0% FX card would be a better deal though. I don’t get why airlines charge approx £1,000 more for staying one less night. It’s criminal pricing. Flying a plane from A to B shouldn’t have anything to do with the fact if you stay 5 nights or 6 nights. Why are they allowed to do this and get away with it? Becuase they are free to price their fares as they wish? If they impose conditions they publish and stick to them then shouldn’t be an issue? Also for example including Saturday night usually means it’s leisure and not business. Though let’s be honest how many business customers aren’t buying flex tickets, I know we have to regardless of how firm our plans are. Interesting. I think some take a different view – for trains at least (which can still be hundreds of pounds within the UK) – book discounted non-refundable then if meeting runs over reimburse that and extra walk up fare. Compared to everyone paying walk up rates there are still significant savings to be had. it’s bcos too many want to fly on the same flight and they need to keep space free for those who really, really need those seats on that particular flight and are therefore prepared to pay what they’re worth. If demand on a particular day/flight/route/aircraft type is low, airlines will price lower to fill the planes and recoup some of their fixed costs. And conversely, if demand is high. This is why airlines want to find out as much as possible about us and our travel needs. They want to know what exactly is the maximum you (or your employer) will pay for you for each flight. That’s one reason frequent flyer schemes are so useful – the data the airline gets both individually and en masse. i can also recommend hong kong, yangshuo and beijing as being top destinations. however, as a china first-timer, u might consider doing the trip in the reverse order to jake (but then, u don’t save £££), as most young hongkongers understand english and backpacker-friendly yangshuo has a very relaxed feel, while many beijing tourist-facing organisations make such a good living from the hordes of chinese travellers that they see no need to make a special effort to cater for the odd foreigner. some of hong kong’s outlying islands, such as lamma island, have a small beach and reasonably-priced weekday non-luxury accommodation; nearby macau has better beaches and hotels. there’s no special reason to go to sanya unless the plane from london happens to stop there (china southern airlines), penang beating it on most counts. i found xi’an a disappointment, four nights being one too many. the terracotta warriors are a must-visit, top-notch attraction if u do go to xi’an, but nearly everything in xi’an itself is modern except the city wall and drum tower. attitudes in xi’an are still stuck in the communist era and the locals expect to receive grumpy service, so don’t expect an easy resolution to any problems with ur hotel or transport, even if u manage to make urself understood. sorry, this was a reply to jake mcloughlin above.